BUIES CREEK, N.C. - Cooper Hummel had two hits including a RBI double that came moments before a heavy storm stopped play in the middle of the fifth allowing the Astros to escape with a 2-1 rain-shortened victory versus the Mudcats on Sunday afternoon at Jim Perry Stadium at Buies Creek. The game was called in the middle of the fifth when a heavy rain storm delayed the game after Carolina's one run fifth inning. The Astros (79-57, 42-25) had a 2-1 lead heading into their half of the fifth when the game was called. Carolina (65-72, 31-36) starter Victor Diaz took the loss despite originally retiring the Astros quickly in the first Diaz (6-8, 4.42) then allowed two straight hits to start the second before later giving up a two-out, bases loaded single to Carlos Canelon. Seth Beer and Jake Adams had the hits that started the second and both ended up on scoring Canelon's two-run single. Diaz allowed just the two runs on five hits over four innings in the loss. Buies Creek led 2-0 after the second and starter Tyler Ivey, after getting out of a bases loaded jam in the first, went into cruise control while holding Carolina to just one run over five innings. Ivey (3-3, 2.69) struck out five, walked three and scattered four hits in the victory. Hummel's RBI double in the fifth cut the Astros lead to 2-1 and came as the rain had begun to fall steadily at Jim Perry Stadium. Ryan Aguilar then followed with a pop out to end the frame just as the nearby lightning and heavy rain forced the game into a delay. Carolina scored just the one run in the fifth and left a runner at second while falling to the Astros 2-1 in the rain and lightning shortened game. They did, however, nearly score a run in the third when Thomas attempted to score on a single to right-center from Hummel. 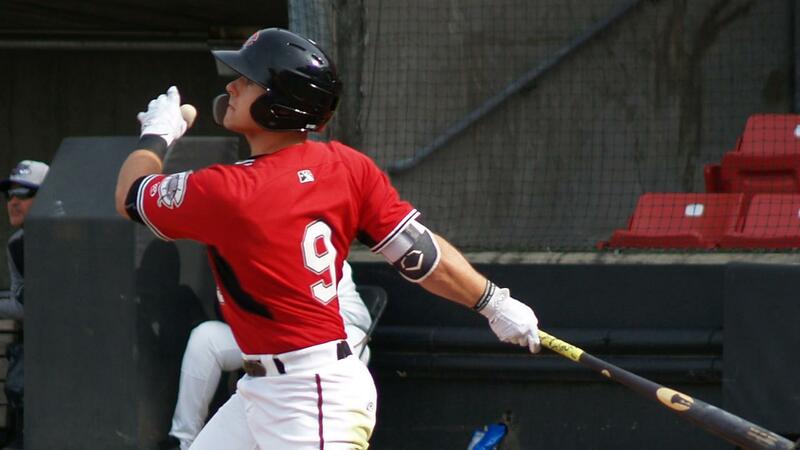 Thomas was caught at home on a throw from right fielder Bryan De La Cruz and Dallas Carroll followed with fly to left as the Mudcats were held scoreless in the frame. The loss dropped the Mudcats into a two games to one deficit in the split, home/away, four game series with the Astros. The series and season will conclude at Jim Perry Stadium on Monday with the first pitched scheduled for 11:00 a.m.
NOTES: Cooper Hummel went 2-for-2 with a RBI double and a walk while raising his Carolina League leading on-base percentage to .398 for the season.